Wow what a week! 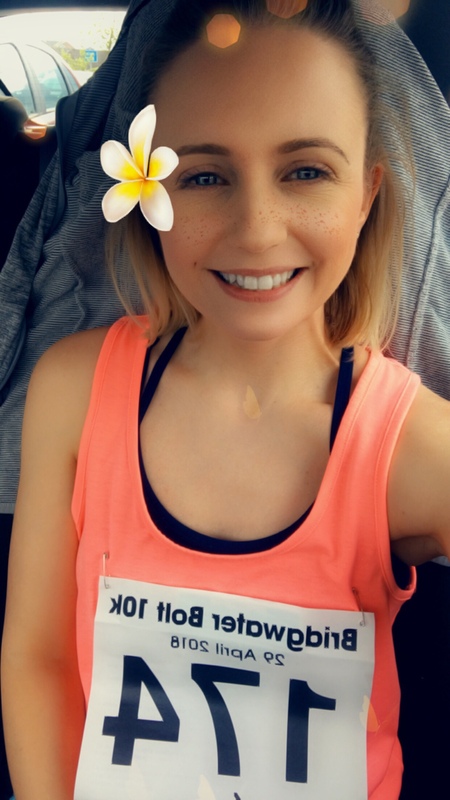 I had a highly anticipated (by me) race on Sunday 29th and I’d put a lot of pressure on myself to get under that elusive hour and I pushed myself HARD on race day but did I get a sub 1 hour time… let’s find out! Disclaimer: This post may have affiliate links, which means if you choose to buy through my links I receive a commission at no extra cost to you! I’ll only ever link products that I absolutely love and use, thank you for supporting me. Yoga is something that I’m always sure I need to do but because it’s not cardio, I’m not interested! I’ve heard for years that yoga is the perfect accompaniment to running and I can see why. I’m terrible at not stretching enough before and after a run (I’ve been working on it) but I wanted to dedicate a day just to yoga. 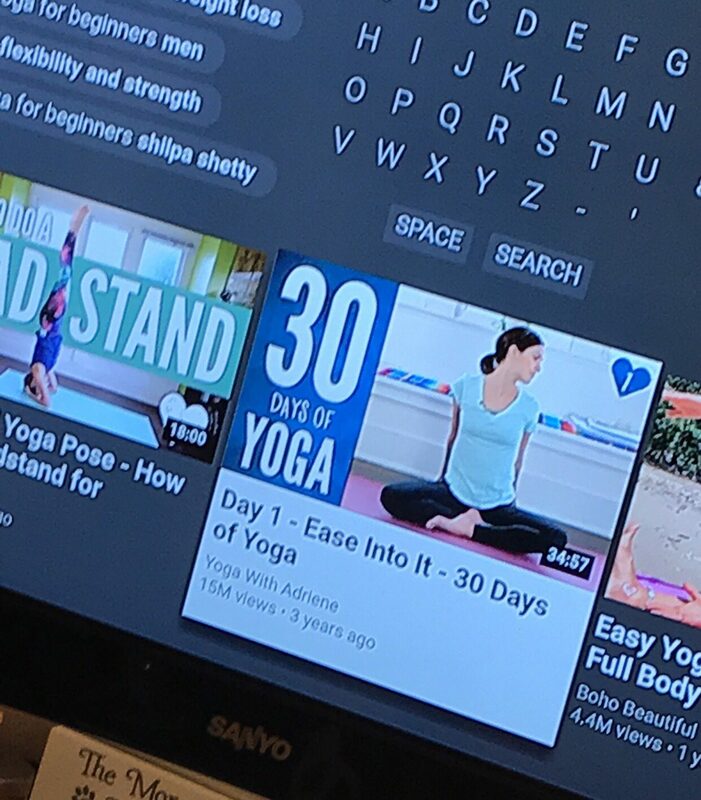 I searched through YouTube (there was no way I was going to do my outdated workout DVDs that go on for hours) and found a YouTube channel ‘Yoga with Adriene – 30 Days of Yoga’ so figured that would be a great place to start. I wasn’t wrong, she’s a really great instructor and it’s not boring like some yoga workouts are. I’m considering next month doing a 30 day yoga challenge and I just might use this series. I ended up in a full on rage today. I went out with the intention of using some kind of pacer on my watch because I need something to keep me on track during races and I really can’t be doing any kind of adding/ subtracting in my mind while I’m running (let’s be honest I can’t do any kind of math even when I’m not running) and I found an add on app for my Garmin Fenix 5s which is called ‘Peter’s Pacer’. Great! Let’s test it out. 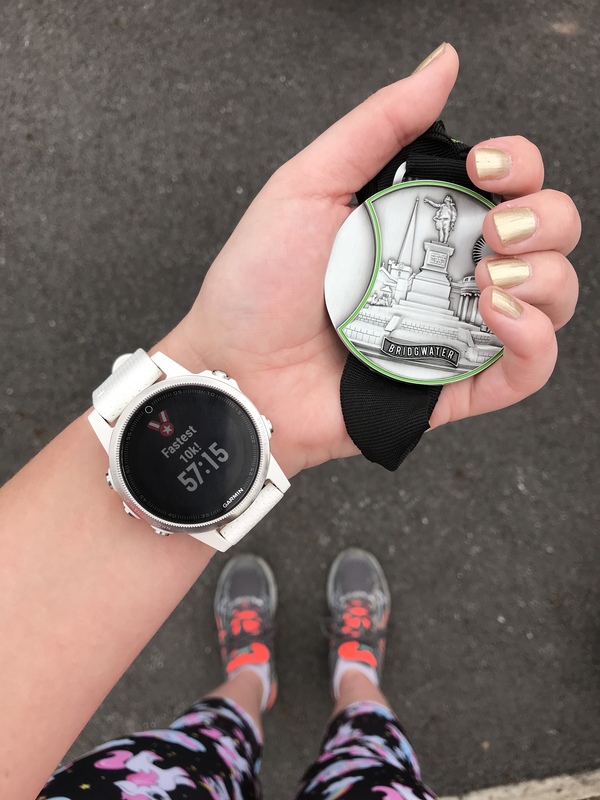 I set the time for 30mins for a 5k run and it alerts you when you are under your target time and shows you how many seconds you’re over/under. Amazing. Except, I was having some kind of internal struggle and went off way too fast thinking in the back of my mind I might get a PB and pushed myself so hard I crashed and burned. I paused my watch several times but the longest time I paused my watch was when I had a major wobbly… the last stretch of my run is on a very long, pretty straight pavement which has got lots of grass on either side. There are lots and lots of dog walkers in this area as well as runners and, unfortunately, cyclists, even though the pavement is fairly narrow. So I spot a cyclist pretty far down the way and so I did that thing that EVERYONE on the planet does, you move to one side of the pavement well in advance (try this out and you’ll be surprised how far away you’ll do this when you’re walking in the opposite direction to another pedestrian). However, this particular cyclist was on his mobile phone looking down. We’re getting pretty close at this point but he’s sort of moved to the left hand side so I go to the right side. At the very last second (while still looking down at his phone) he swerves to the right side and nearly hits into me! I had to put my hands out and say ‘hey’ so that he doesn’t cycle straight into me. His response….?? Now you’d probably think he’d say ‘sorry, I wasn’t looking where I was going’…. no. He shouts back at me ‘hey’ as if I’d just run into him and then cycles off proceeding to look back and shout stuff at me. What an absolute total idiot! If you know me, I’m the least confrontational person on the planet so I was shocked at myself when I was so angry at his response, I turned around and shouted ‘look where you’re going’! There are not many things that irk me as much as people cycling on pavements, especially if they’re going fast. You perhaps might think ‘maybe it was dusk’ or ‘perhaps you weren’t wearing bright enough clothing’ and both of these would be wrong. I was wearing my BRIGHT PINK LEGGINGS, people could have spotted me from twenty times the distance that we nearly collided. If he had looked up for even 1 second, he would have seen me! So that put me in a pretty bad mood and I nearly abandoned my run entirely. Investing in a treadmill looks more and more appealing than braving it out in the urban jungle. Anyway… enough of my near death experience, back to my watch. I was using this app to pace myself and when I reached 5k, finally, I stopped my watch but it didn’t actually record like it usually does so I was not happy about that! Went to Cardiff today with work so today ended up being my cheat meal day (which was amazing), but I was definitely feeling it later on in the evening. Considered doing some kind of cardio workout but I was feeling super tired so had a rest instead. Out here living my best life eh! 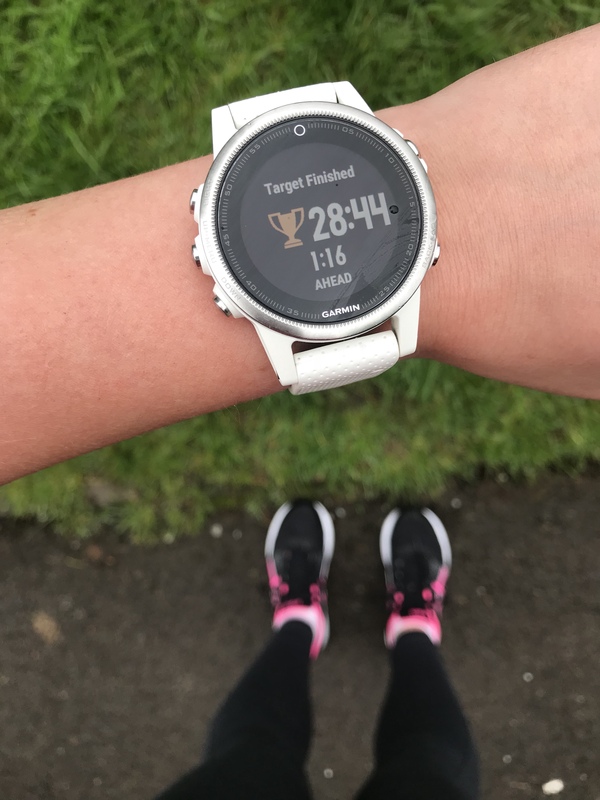 I had an easy run on the agenda today but I was in a bit of a grump and still super tired so I skipped it but I did find a really useful Garmin tool. After my failed run on Tuesday with the Garmin add on I reasoned that the Fenix 5 is a pretty amazing watch there must be a way for me to do the same thing on the main watch functions. And Son of a Gun there was! And it was even better than the other one. If you go to ‘run’ and hold the menu button it will take you into another menu. Select ‘training’ and go down to ‘set a target’. Here, you can set a distance only, distance and time or distance and pace goal. On these data screens it will show you your time ahead/ behind, an avatar to show how far/close you are on pace and your estimated finish time. I can’t wait to go out and test it! The Garmin Virtual Pacer is going to be a game changer for me, I can tell already. I tested it out today for my easy 5k run with a 30 minute goal. Even though this isn’t too difficult a time for me to achieve, it was pretty windy so I had to work much harder but it did keep me on track. I have a race tomorrow and I am definitely going to use this tool to get by sub 1 hour time. I was feeling really pumped for this race and I was feeling nervous, which is unusual for me, but I knew I was going to be going for under an hour as opposed to turning up and ‘trying my best’. I have to say, this new mindset of mine is helping greatly with my running! I think I’ve realised that actually I SHOULD be improving after running consistently for over a year and, apart from injuries I’ve had, there’s no good reason why I shouldn’t be smashing those PBs. This was such a great race, I really enjoyed it. The course was pretty much flat with a couple of hills around 4 miles and 5.5 miles but I was so determined to run them and I’ve slowly come to realise that if there’s a hill up, there’s bound to be a lovely hill to run down!! So, armed with my new ‘trick’ up my sleeve, I set my Garmin for a time of 59:30 (just to doubly make sure I was under the hour). The first mile or so of the race was really frustrating because there was a narrow pathway that you have to navigate, but so too do a couple of hundred other people. 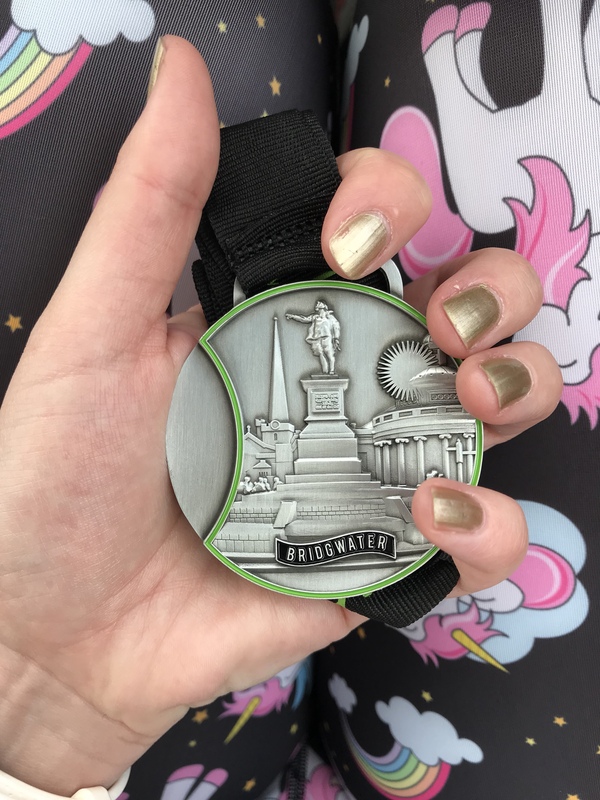 My time was dwindling before my eyes and I was starting to panic that I’d never make up this time further in the race so the first opportunity I got I tried to dash inbetween the other runners ahead of me and get my watch ahead by a couple of seconds. 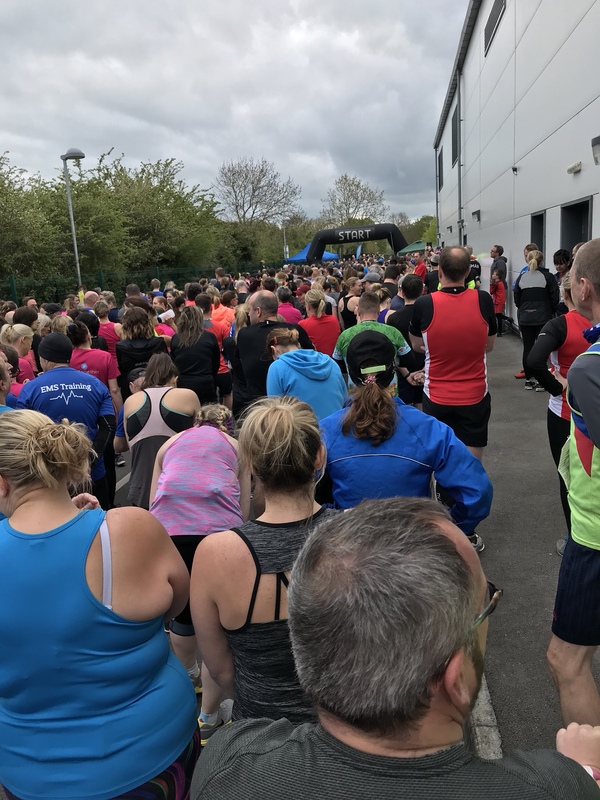 As I eased into the race, I’d managed to get around 1 min ahead of my race time and logic told me that if I could keep this 1 min buffer time I’d be able to finish in under an hour easily… The hills did have a bit of an effect on me but by this time I’d managed to get around 2 mins ahead! Whoop go me! 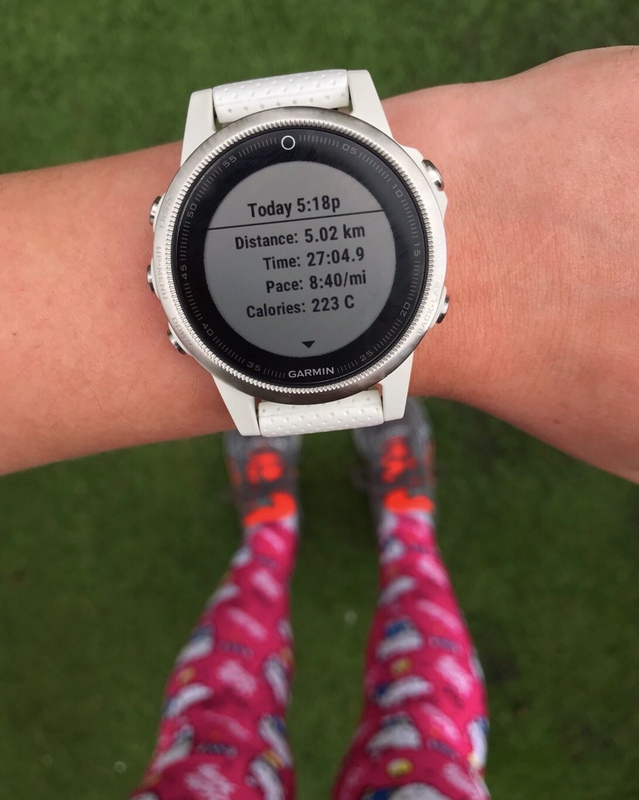 This was when I started to get a little excited when it dawned on me that not only could I get under an hour, I might actually hit an ALL TIME PB!! Once that thought occurred to me there was no stopping me and I pushed myself right to the end, finishing with a time of 57:15. 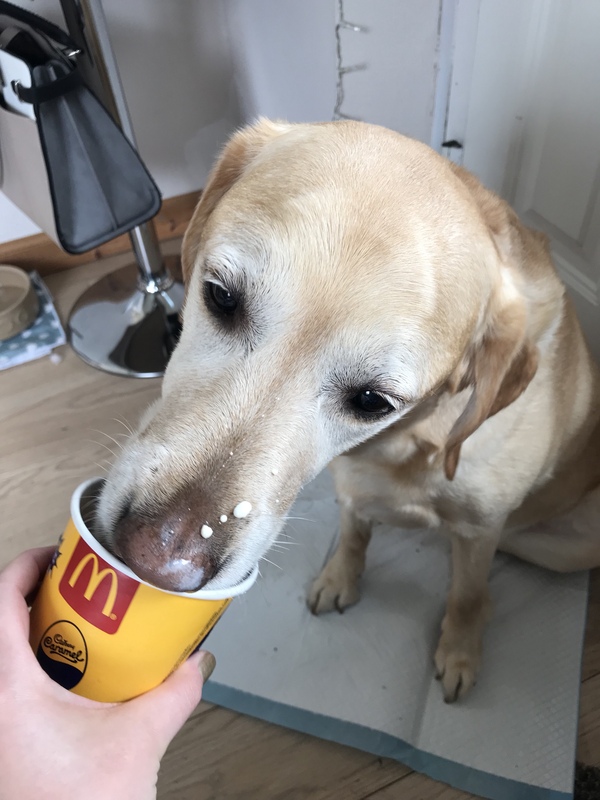 Obviously we had to celebrate with our first ever McFlurry too! There you have it. Change your mindset and you can change your whole world! Hoping you’ve all had a great week and that you too can change your whole worlds.